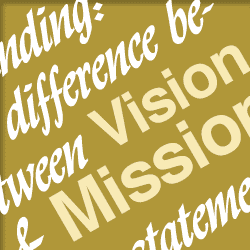 Vision and Mission statements are often confused… or thought to be the same thing. They play an important part in the branding of a company – both internally and externally. These statements should be the moral compass of the company. Clients should be able to read them and see exactly how these declarations define the company. Employees should be able to read these and recognize a consistent direction of the company and how they can fit into the culture. Well conceived Vision and Mission statements can attract and retain the right talent and customers. I say “conceived” and not “written” because the success of these are dependent on the passionate belief in them by the person(s) at the top – not simply the skillful artistry of the copy writer. You’ll find many definitions online of Mission Statements, but they tend to mean mostly the same thing – defining the company’s purpose. Most people regard a Mission Statement as the What (product or service) we do, Who (target audience), and How (method that differentiates it) of the company. They are just two or three sentences and articulates what the company is about. for people of all ages, everywhere. Amazon: To build a place where people can come to find and discover anything they might want to buy online. The Vision Statement is about the company’s future goals – ideally what this company would like to accomplish if it fulfills the company’s Mission consistently over X number of years. It’s a company’s passionate belief statements. Your own Vision Statement should make your heart pound a bit faster. A Vision Statement is more based on the WHY rather than the What, Who and How. It should intentionally appeal to the emotions of interested parties. Bottom line: If the Vision Statement can inspire the business owner to get out of bed in the morning during the tough times, it is successful. It means it has heart-felt buy in; not simply a product of creative writing. Vision and Mission statements shouldn’t be taken lightly. They should be a collaborative effort with the principal(s) of the organization so that it becomes embedded into the culture and content (branding) of the organization. The Mission Statement should clarify the company’s purpose to potential customers and employees and is more concise and factual than the Vision Statement. The Vision Statement is much more idealistic. It should inspire the principal(s) of the company and shareholders. It should make one proud to be a part of the organization.